We need to recognise good practice, engage researchers early in their career with research data management and use peers to talk to those who are not ‘onboard’. These were the messages five attendees at the Engaging Researchers in Good Data Management conference held on the 15th of November. 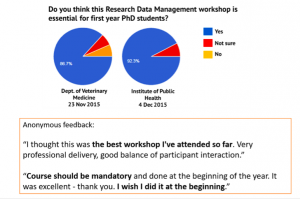 The Data Champions and Research Support Ambassadors programmes are designed to increase confidence in providing support to researchers in issues around data management and all of scholarly communications respectively. Thanks to the generous support of the Arcadia Foundation, five places were made available to attend this event. In this blog post the three Data Champions and two Research Support Ambassadors who were awarded the places give us the low-down on what they got out of the conference and how they might put what they heard into practise. Recordings of the talks from the event can be found on the Cambridge University Library YouTube channel. As a researcher who cherishes good and reproducible data analysis, I naturally view good data management as essential. I have been involved in research data management activities for a long time, acting as a local data champion and participating in open research and open data events. I was interested in participating in this conference because it gathered data champions, stewards and alike from various British and European institutions (Cambridge, Lancaster, Delft), and I was curious to see what approaches were implemented and issues were addressed across institutions. Another aspect of data championship/stewardship I am interested in is the recognition these efforts offer (this post touches on this a bit). Focusing on the presentations from Lancaster, Cambridge and Delft, it is clear that direct engagement from active researchers is essential to promote healthy data management. There needs to be an enthusiastic researcher, or somebody that has some experience in research, to engage with the research community about open data, reproducibility, transparency, security; a blunt top-down approach lead to limited engagement. This is also important due to the plurality of what researchers across disciplines consider to be data. An informal setting, ideally driven by researchers and, or in collaboration with librarians, focusing on conversations, use-cases, interviews, … (I am just quoting some successful activities cited during the conference) have been the most successful, and have sometime also lead to new collaborations. Despite the apparent relative success of these various data championing efforts and the support that the data champions get from their local libraries, these activities remain voluntary and come with little academic reward. Being a data champion is certainly an enriching activity for young researchers that value data, but is comes with relatively little credit and without any reward or recognition, suggesting that there is probably room for a professional approach to data stewardship. With this in mind, I was very interested to hear the approach that is currently in place at TU Delft, where data stewards hold a joint position at the Centre for Research Data and at their respective faculty. This defines research data stewardship as an established and official activity, allows the stewards to pursue a research activity, and, explicitly, links research data to research and researchers. I am wondering if this would be implemented more broadly to provide financial recognition to data stewards/champions, offer incentives (in particular for early-career researchers) to approach research data management professionally and seriously, make data management a more explicit activity that is part of research itself, and move towards a professionalisation of data management posts. Tasked with improving and updating best practice in the MRC Biostatistics Unit, I went along to this workshop not really knowing what to expect but hopeful and eager to learn. Good data management can meet with resistance as while it’s viewed as an altruistic and noble thing to do many researchers worry that to make their research open and reproducible opens them to criticism and the theft of ideas and future plans. What I wanted to know are ways to overcome this. And boy did this workshop live up to my expectations! From the insightful opening comments to the though provoking closing remarks I was hooked. All of the audience were engaged in a common purpose, to share their successes and strategies for overcoming the barriers that ensure this becomes best practice. Three successful schemes were talked through: the data conversations in Lancaster, the Data Champion scheme at the University of Cambridge and the data stewards in TU Delft. All of these successful schemes had one thing in common: they all combine a cross department/ faculty approach with local expertise. Further excellent examples were provided by the lightning talks and for me, it was certainly helpful to hear of successes in engaging researchers on a departmental level. The highlight for me were the focus groups – I was involved in Laurent Gatto’s group discussing how to encourage more good data management by highlighting what was in to for researchers who participate but I really wish I could have been in them all as the feedback indicated they had given useful insights and tips. All in all I came away from the day buzzing with ideas. I spent the next morning jotting down ideas of events and schemes that could work within my own unique department and eager to share what I had learnt. Who knows, maybe next time I’ll be up there sharing my successes!! The one-day meeting on Engaging Researchers in Good Data Management served as a good chance to remind all of us about the benefits, but also the responsibilities we have to manage, and share, data. On the positive side, I was impressed to see the diversity of approaches lead by groups around the UK and beyond. It is heartening to see many universities now with teams to help manage and share data. However, and more critically, I am concerned that meetings like this tend to focus on showcasing good examples to an audience that is already mostly convinced of the benefits of sharing. Although it is important to build the community and make new contacts with like-minded souls, I think we need to spend as much time engaging with the wider academic community. In particular, it is only when our efforts can be aligned with those of funding agencies and scholarly publishing that we can start to build a system that will give due credit to those who do a good job of managing, and then sharing, their data. I look forward to future meetings where we can have a broader engagement of data managers, researchers, funders and publishers. I am grateful to the organisers to have given me the opportunity to speak about our code review pilot in Neuroscience. I particularly enjoyed the questions. Perhaps the most intriguing question to report came in the break when Dr Petra ten Hoopen asked me what happens if during code review a mistake is found that invalidates the findings in the paper? To which I answered (a) the code review is supposed to verify that the code can regenerate a particular finding; (b) that this is an interesting question and it would probably depend on the severity of the problem unearthed; (c) we will cross that bridge when we come to it. Dr ten Hoopen noted that this was similar to finding errors in data that were being published alongside papers. These are indeed difficult questions, but I hope in the relatively early days of data and code sharing, we err on the side of rewarding researchers who share. Prior to this conference, my experience with Research Data Management (RDM) was limited to some training through the Office of Scholarly Communication and Research Support Ambassadors programme. This however really sparked my interest and so I leapt at the opportunity to learn more about RDM by attending this event. Although at times I felt slightly out of my depth, it was fascinating to be surrounded by such experts on the topic. The introductory remarks from Nicole Janz were a fascinating overview of the reproducibility crisis, and how this relates to RDM, including strategies for what could be done, for example setting reproducing studies as assignments when teaching statistics. This clarified for me the relationship between RDM and open data, and transparency in research. 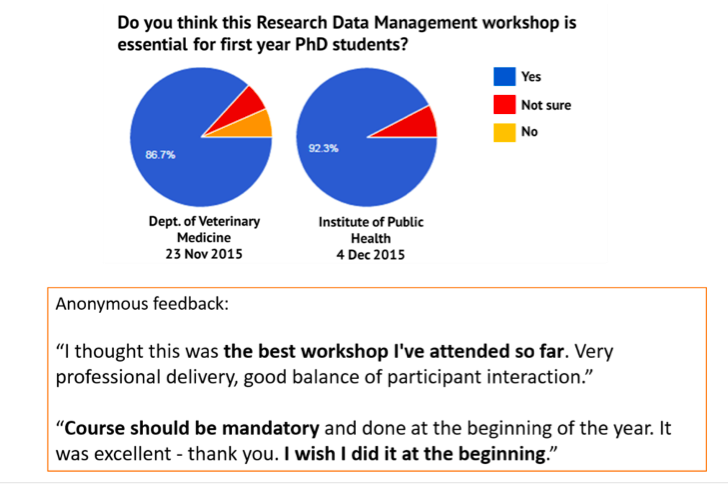 There were many examples throughout the day of best practice in promoting good RDM, from the “Data Conversations” held at Lancaster University, international efforts from SPARC Europe and even some from Cambridge itself! Common ground across all of them included the necessity of utilising engaged researchers themselves to spread messages to other researchers, the importance of understanding discipline specific issues with data, and an expansive conception of what counts as “data”. I am based in a college library and predominantly work supporting undergraduate students, particularly first years. In a way this makes it quite a challenge to present RDM practices as many of the issues are most obviously relevant to those undertaking research. However, I think there’s a strong argument for teaching about RDM from very early in the academic career to ingrain good habits, and I will be thinking about how to incorporate RDM into our information literacy training, and signposting students to existing RDM projects in Cambridge. This inspirational conference was organised and presented by people who are passionate about communicating the value of open data and replicability in research processes. It was valuable to hear from a number of speakers (including Rosie Higman from the University of Manchester, Marta Busse-Wicher from the University of Cambridge and Marta Teperek from TU Delft) about the changing role of support staff, away from delivering training to one of coordination. Peers are seen to be far more effective in encouraging deeper engagement, communicating personal rather than prescriptive messages (evidenced by Data Conversations at Lancaster University). A member of the audience commented that where attendance is low for their courses, the institution creates video of researcher-led activities to be delivered at point of need. Inclusivity – Beth Montagu Hellen (Bishop Grosseteste) highlighted the pressing need for open data to be made relevant to all disciplines. Cambridge promotes a deliberately broad definition of data for this reason. Yet more could be done to facilitate this; I’ll be following @OpenHumSocSci to monitor developments. We’re fortunate to have a Data Science Group at Wolfson promoting examples of best practice. However, I’m keen to meet with them to discuss how their activities and the language they use could be made more attractive to all disciplines. Communication – Significant evidence was presented by Nicole Janz, Stephen Eglen and others, that persuading researchers of the benefits of open data leads to higher levels of engagement than compulsion on the grounds of funder requirements. This will have a direct impact on the tone and content of our support. A complimentary approach was proposed: targeted campaigns to coincide with international events in conjunction with frequent, small-scale messages. We’ll be tapping into Love Data Week in 2018 with more regular exposure in email communication and @WolfsonLibrary. As result of attending this conference, I’ll be blogging about open data on the Wolfson Information Skills blog and providing pointers to resources on our college LibGuide. I’ll also be working closely with colleagues across the college to timetable face-to-face training sessions.